Recently we went out for a lovely breakfast with our friends Mary and Ron in Denver. As we were conversing over breakfast, the topic came up of what it is like for Steve and me to be together nearly 24/7? 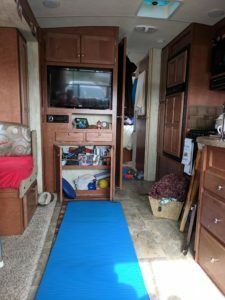 They encouraged us to share something about our close proximity since launching our full-time RV lifestyle on July 29, 2018. We will share our thoughts over several posts. This will be Installment One! We met just over 45 years ago and we’ll observe our 43rd wedding anniversary this spring. So…thankfully, we sort of like each other! There have been very few experiences of living in a 24/7 situation. One that we recall is the summer of 2010. 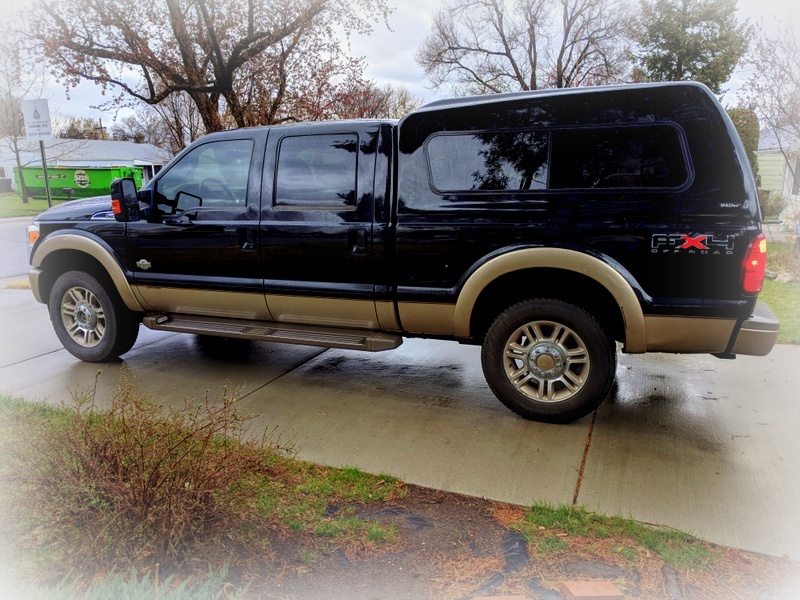 We had just moved our household from Illinois to Colorado. It was placed in a storage unit in Colorado for the bulk of the summer. Then, Steve and I traveled from early June through mid-August before settling into life in Denver. We were together a good chunk of that time. Admittedly, it didn’t involve living in a “tiny-home on wheels” as we’re doing now. We were travelers and tourists at that point. 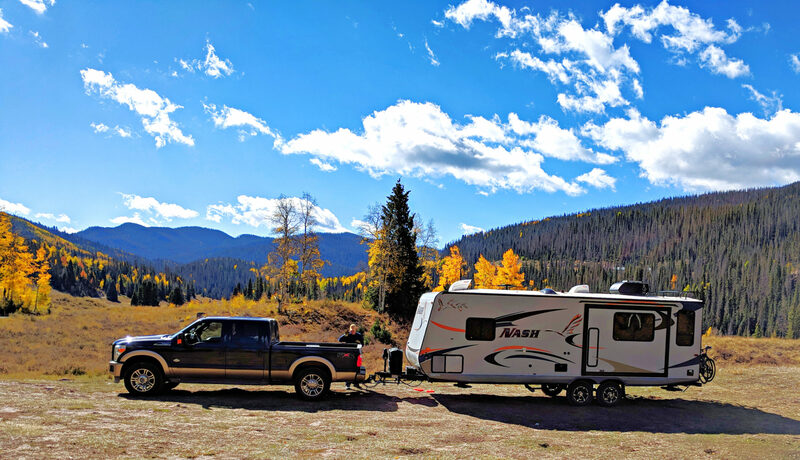 Let’s see what we can share with everyone on what it is like to be living the full-time RV lifestyle in roughly 200 square feet of living space. We used to begin the day fairly independent of one another. We each had a routine that included sipping on morning coffee, checking news apps or watching a morning news show while getting the day started, showering, and opportunities to be in separate rooms checking emails or social media. Now in such a small space, we tend to overlap one another in various ways. Something that I have embraced for years is a morning meditation of sorts that includes prayer. I used to sit quietly on our comfy sofa or loveseat with a cup of coffee and the morning sun coming through the window. Nowadays, I stay in bed while Steve ventures into the living space of our trailer. I remain prone without coffee to quietly have my prayer time. Our former routine included us grinding coffee the night before and setting the 12-cup Cuisinart coffee maker to automatically begin perking the next morning. Fast forward to our tiny space and we find Steve manually grinding the coffee on most days, getting the tea kettle of water on a burner, and making French press coffee while I’m having my prayer time. I used to have what I considered a small space in the bedroom of our last rental home where I’d do my morning stretches and strengthening exercises with my iPod classic playing my favorite quiet music. 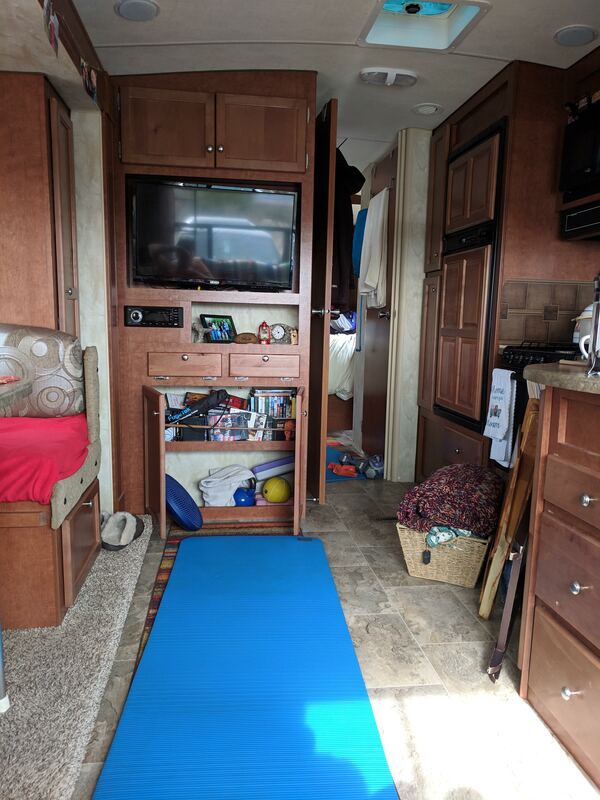 In the trailer, the small space has shrunk from the former “ample” area. 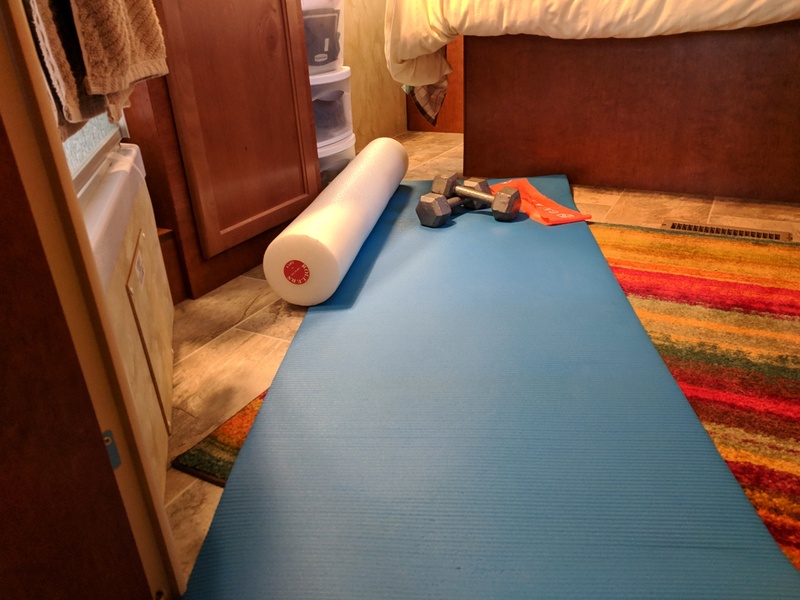 Instead I squeeze my yoga mat between the shower stall, commode door, foot of our bed, and next to the little vanity….with the door open into the living space. It feels quite confining and not relaxing. In reality, it cramps my style and is perhaps one of my excuses for the lax attitude about my morning stretches and strengthening exercises. Recently Steve added a stretching routine, so we have created two separate “workout” spaces. What aspects of your morning routine do you treasure?